After a weekend of flat calm finally two days of good wind, which allowed us to recover the two lost tests thus giving a credible face to the ranking of 44Winter and, consequently, also to that of the Winter Championship of the West. To be sure of being able to complete two tests a day, the Race Committee had issued a communiqué from Monday evening in which the departure was anticipated from 10:30 to 10:00. 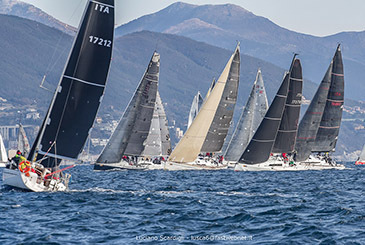 In fact, the first departure on Saturday for the ORC / IRC was given at 10:35, with a tramontana around 20 knots that blew on the race course in front of Celle Ligure and a bitter cold. Spirit of Nerina, the X-35 OD of Paolo Sena, Varazze Club Nautico, imposed itself in time compensated ORC on Voscià, the Comet 45S of Aldo Resnati, LNI Milan, first to cross the finish line in real time, while in third place Obsession arrived, the First 45 by Mario Rossello, LNI Savona. Voscià was imposed in ORC 0-2, Spirit of Nerina in ORC 3 and Sangria, the Elan 31 of Carlo Tadeo, ASD Forza and Coraggio, was first in ORC 4-5. As often happens given the different compensation system the IRC ranking had a different face. First was Just a Joke, Dino Tosi's A-35, CC Mandracchio, ahead of Obsession and Spirit of Nerina. Obsession was imposed in IRC 0-2 and Just a Joke in IRC 3-5. Among the Gran Crociera, departed at 10:45, Bilbo, the Oceanis 331 by Mario Scolari, Varazze Club Nautico, regulated Parthenope, the Dufour 350 GL by Vincenzo Pallonetto, LNI Varazze, and Roxanne, the First 47.7 by Claudio Capuana, LNI Varazze. Roxanne prevailed in Gran Cruises 0-3 and Bilbo in Gran Crociera 4-5. This time the winner in IRC corresponded to the one in ORC, with just behind Joke and Controcorrente , the XP 33 of Luigi Buzzi, CC Celle. In the Gran Crociera first in Parthenope plywood, in front of Nuvola Rossa, the J-24 of Marco Sella, LNI Varazze, and Roxanne, with the latter first in ORC 0-3 and Parthenope in ORC 4-5. At the end of this hard day, return to the Marina of Varazze where the racers have found refreshment with a wine tasting organized at the office waiting for jury communications and provisional rankings. Sunday before departure for the ORC / IRC at 10:25, always on Celle Ligure, but with a slightly less tense wind, around 10-12 knots and a bright sun that gave a spectacular day of racing. First in plywood Vitamina, on Spirit of Nerina and Controcorrente, with the first two that win respectively the ORC groupings 0-2 and ORC 3, while the victory in ORC 4-5 goes to Sangria. In IRC Just a Joke precedes Spirit of Nerina and Controcorrente, with Roby and 14, Farr 40 by Massimo Schieroni, YC Savona, first in IRC 0-2 and Just a Joke in IRC 3-5. In ORC the new victory of Bilbo, ahead of Parthenope and Mediterranea, the X-362 of Marco Pierucci, CV Canottieri Domaso, the latter first in the grouping Gran Crociera 0-3 while Bilbo won 4-5. At 12:47 the fourth weekend regatta started, which brought the rehearsals back to the original program. In ORC still Spirit of Nerina in front of everyone, followed by L'Escargot, the First 34.7 by Fabio Costa and Cesare Iacobucci, LNI Sestri Ponente, and by Just a Joke. In ORC 0-2 victory of Voscià, while ORC 3 won Spirit of Nerina and ORC 4-5 L'Escargot. The IRC podium saw Just a Joke, in front of Spirit of Nerina and Roby & 14, with the latter first in IRC 0-2 and Just a Joke first in IRC 3-5. Still Bilbo in Gran Crociera, in front of Nuvola Rossa and Sora Lella, the First 34.7 of Roberto Allocco, Varazze Club Nautico. In Gran Crociera 0-3 first place for Mediterranea while in Gran Crociera 4-5 Bilbo excelled. After the first four tests, the 44Winter classification definitely starts to take shape, and on the four tests the competitors can already discard the worst. In ORC Spirit of Nerina by Paolo Sena, with a clear advantage on Vitamin and Controcorrente. Voscià commands the ORC 0-2 classification, Spirit of Nerina the ORC 3 and Sangria the ORC 4-5. Turning to the IRC, the temporary primacy goes to Just a Joke, followed only two points by Spirit of Nerina, with more detached Controcorrente. Roby & 14 drives the IRC 0-2 while Just a Joke is first in IRC 3-5. Bilbo leads the general classification of the Grand Crociera, followed closely by Parthenope and Nuvola Rossa. In ORC 0-3 he leads the Mediterranean classification, while in ORC 4-5 we find the same ranking of the general. impeccably managed by the Cdr and the tireless work of the CdP There is only one test at the end of the 44Winter some classes the minimum gaps leave presage a battle to the last edge. Then, on Saturday 16 February, for the last regatta and on Sunday 17, when, at 11:30, the 44Winter and the Winter Championship of the Pontoon 2018-19 edition will be held.